A Lebanese judge investigating the killing of former Prime Minister Rafik Hariri has asked to step down from the case, officials in Lebanon have said. Lebanon's judicial council is expected to decide on Thursday whether to agree magistrate Michel Abu Arraj's request. 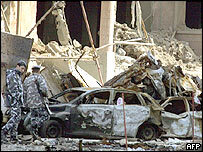 It comes shortly before the expected release of a UN report into the 14 February attack in the capital, Beirut. UN Secretary General Kofi Annan has said a more in-depth investigation into the assassination may be necessary. The UN team, made up of Irish, Egyptian and Moroccan investigators, competed its fact-finding mission last week and has reported back to Mr Annan. "Within the next few days, I expect to release the report of the mission of inquiry I established in the wake of the killing," Mr Annan told an Arab League summit on Wednesday. "A more comprehensive investigation may also be needed," he added. Mr Arraj's request to be excused from the case, citing his heavy court schedule, may delay the Lebanese authorities' own inquiry into the attack which killed Mr Hariri and at least 15 others. The judicial council will have to decide at Thursday's meeting whether to accept Mr Arraj's resignation and appoint another magistrate, or to freeze the investigation. Lebanon's opposition and many Lebanese have blamed Syria and the pro-Syrian Lebanese government and intelligence services in Beirut for the bombing, despite strong denials from Damascus and Beirut.